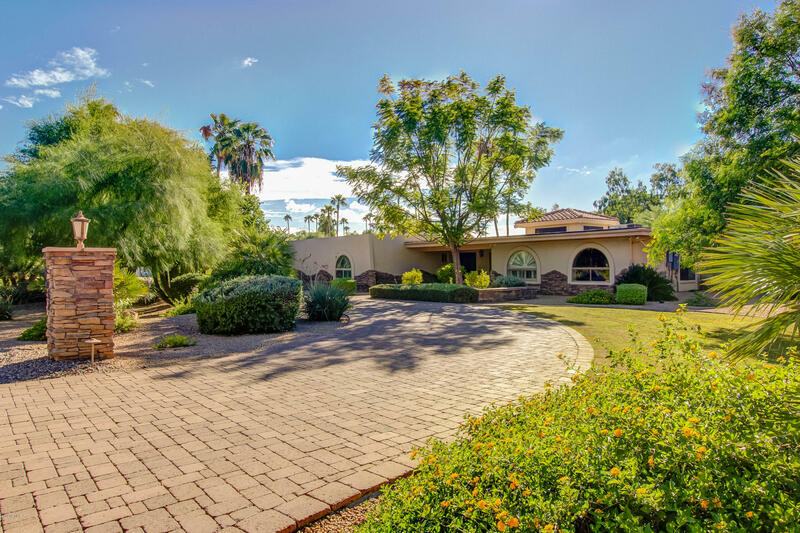 All PARADISE VALLEY FARMS homes currently listed for sale in Scottsdale as of 04/23/2019 are shown below. You can change the search criteria at any time by pressing the 'Change Search' button below. "Exquisite estate on over an acre in the sought after, tree lined neighborhood of Paradise Valley Farms. You won't believe the resort like feel this home offers on the interior & exterior with landscaping designed by award winning designer Greg Trutza (Royal Palms resort). 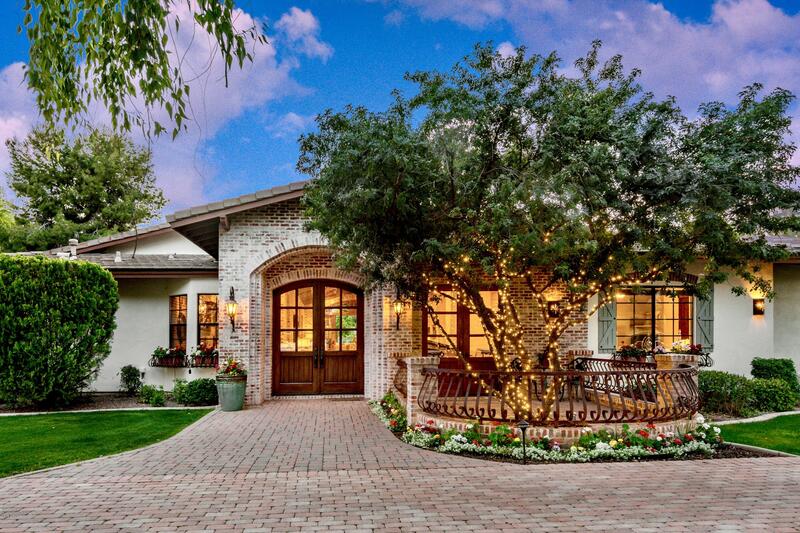 This striking home has been featured in both Phoenix Home & Garden & Sunset magazines. The beautiful, warm design is an entertainer's dream featuring a chef's kitchen, custom-cabinetry, stone floors, Venetian plaster & many ot"
"Designed to be the ultimate private sanctuary setting this stunning French country style gated custom estate (originally built in 1970) is situated on a fabulous private quiet acre lot in the heart of highly desired Paradise Valley Farms enclave of homes in Scottsdale & recently had 2 separate extensive remodels in both 2014 & 2017. 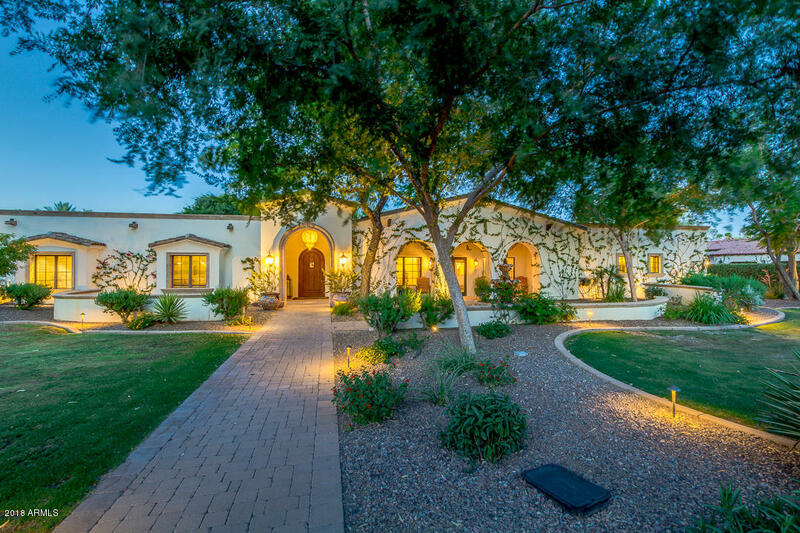 This gorgeous recently renovated custom home features 4 bedrooms, 4 full bathrooms, 3 half bathrooms, and an office in the main house and has a separate spacious g"
"Welcome to Paradise Valley Farms. One of the most sought after estate neighborhoods.Santa Barbara style architecture combines fabulous interiors with casual elegance in a 5 bed/5.5 bath home. The open floor plan features a country kitchen and family room, 3 fireplaces, wood plank and travertine floors. A split Grand Master Suite built in 2006 features a spa like bath, exercise room with direct pool access, library/study. A separate wing hosts 4 en suite bedrooms for kids or guests. Brick barrel "
"Welcome to the tree lined, prestigious Paradise Valley Farms. 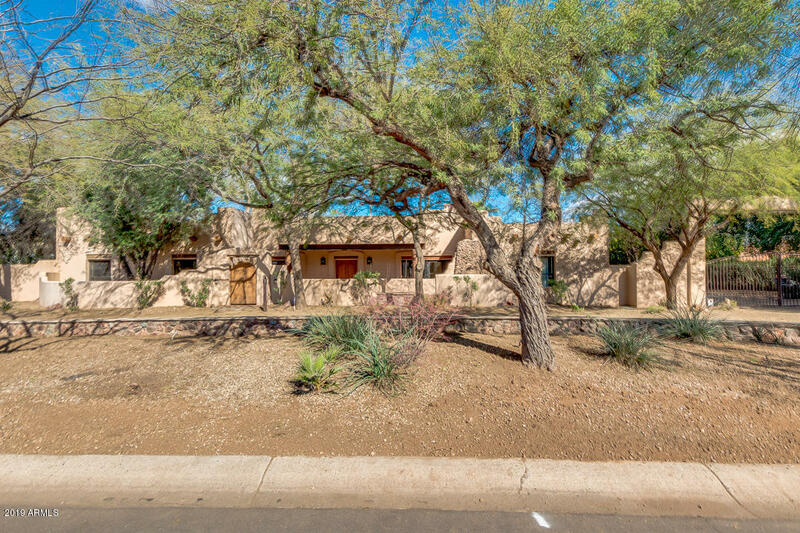 This corner lot gem was a 2004 ground up rebuild, designed by renowned Scottsdale architect Daniel Chavez of Chavez and Associates. The 5 bedroom, 5.5 bath home exudes warmth and charm galore. Unique features include reclaimed oak barnwood flooring, Chicago white-washed brick and custom knotty alder cabinetry and exterior doors. 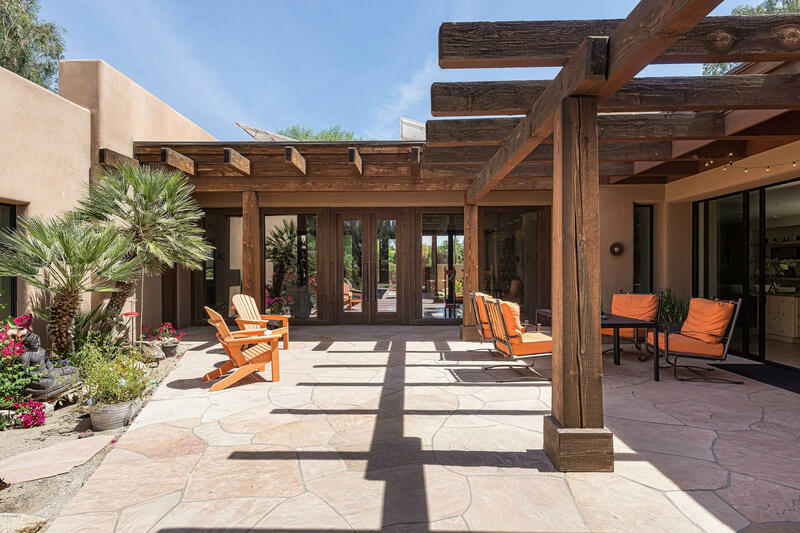 Vaulted beamed ceilings, a rustic fireplace mantel and double doors opening onto the large veranda comb"
"ONE OF THE MOST EXCITING CUSTOM HOMES INPARADISE VALLEY FARMS. PRICED TO SELL! A VERY WARM RUSTIC, BUT CONTEMPORARY FEEL DESIGNED BY SHELBY WILSON. ENTER FRONT GATE TOGRASSED COURTYARD. OPEN THE INCREDIBLEOVERSIZED CUSTOM WOOD FRAMED GLASS DOUBLE DOORS TO LARGE LIVING ROOM THATLOOKS OUT THROUGH OTHER SET OF DOORS TOSERENE BACKYARD PARADISE. FLAGSTONE FLOORS THROUGHOUT EXCEPT BEDROOMS WHICH HAS WOOD IN MASTER AND GUEST HOUSE. CARPET IN OTHER BEDROOMS. BEDROOMS WITH EN-SUITE BATHS. FOLIAGE & BEAU"
"Charming home on 1.06 acres, 5 bedrooms and 3.5 baths, formal living and dining room. Large family room with game room and wet bar. Eat in kitchen opens to the pool area. Kitchen has 2 ASKO dishwasher, Viking oven, microwave, warming drawer. Master bedroom has her/his closets and separate exit to yard.Tennis court and pebble-tee pool with water feature." "Prepare to be amazed! Come and see this breathtaking 4 bed, 2.5 bath horse property in Paradise Valley Farms! This luxurious home sits on a 1.5+ acre lot and offers a 6 car garage, pool, RV gate, and horse area. The fabulous kitchen offers ample cabinetry, a pantry, granite countertops, top of the line stainless steel appliances, and a charming island with breakfast bar. Grand master bedroom boasts a private entry, a bath with double sinks, and a spacious walk-in closet. Step out back to your tr"